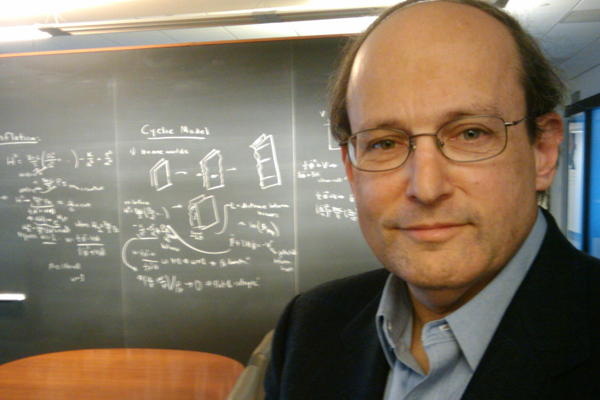 Paul Steinhardt is a theoretical physicist whose research spans cosmology, astrophysics, particle physics, condensed matter physics, geophysics and photonics. He is one of the architects of inflationary cosmology, a modification of the big bang theory that proposes to explain the large scale structure of the universe. He also the first to demonstrated phenomenon known as eternal inflation, an unintended consequence of inflation and quantum physics that leads to a multiverse, instead of the smooth and flat universe that inflation was supposed to create. This led him to become a skeptic and to develop competing alternatives, such as the cyclic theory of the universe, in which the big bang is replaced by a big bounce. Steinhardt’s other research includes novel theories for dark energy, such as quintessence, and for dark matter. In condensed matter physics, he introduced the concept of quasicrystals, a new phase of solid matter with rotational symmetries forbidden for conventional crystals. In 2011, he led a search that discovered the first natural quasicrystals at a remote site in far northeastern Russia. He is also working towards new designer materials for photonic communications and computer devices. Steinhardt is the Albert Einstein Professor in Science and Director of the Princeton Center for Theoretical Science at Princeton University. He is a Fellow in the American Physical Society and a member of the National Academy of Sciences. He shared the P.A.M. Dirac Medal in 2002 for his contributions to the inflationary model of the universe; the Oliver E. Buckley Prize of the American Physical Society in 2010 for his contribution to the theory of quasicrystals; and the John Scott Award in 2012 for his search and discovery of the first natural quasicrystals. He is the author of over 200 refereed articles, ten patents, three technical books, and, in 2007, co-authored Endless Universe: The Big Bang and Beyond, a popular book on contemporary theories of cosmology.